Cascais and nearby Sintra offer a beguiling mixture of history and culture combined with the burgeoning modernism that continue to give both towns their forward-looking, cosmopolitan feel. There is plenty to see here to keep art, history and culture buffs occupied for several visits and it seems that with every year that passes, something new springs up to please them. Begin your cultural tour with a day in the galleries of Cascais before moving on to admire the architectural beauty of Sintra and explore the many secrets behind some of the walls of this magical, beguiling town. Paula Rego is one of the most celebrated Portuguese artists of modern times. Paula studied at the Slade in London and has enjoyed international success with exhibitions in the UK, Portugal and all over the world, including at the Tate Modern and Saatchi Gallery. Originally from Lisbon, Paula has made her home in Cascais as the Casa das Historias Paula Rego, an ambitions project in conjunction with the famous architect, Eduardo Souto de Moura. Souto de Moura designed the Casa das Historias Paula Rego to echo the distinctive architectural landscape of the region in a contemporary manner to great effect, with huge red-hued pyramids dominating the rooftop. The building is as much a piece of art as the works it showcases and is well worth a visit for anyone with an interest in art or architecture who finds themselves in Cascais. The Casa das Historias Paula Rego features seven rooms of works by Rego herself, along with a selection of temporary exhibitions by various artists. It is a favourite haunt of the young, fashionable art crowd from Lisbon’s leading art school, who come to hang out and absorb its creative atmosphere in the exhibition rooms and the little café in the interior courtyard. The Viragem art gallery is a favourite in the town amongst locals and visitors alike. Established here for several decades, the Viragem shows regular exhibitions by local, national and international names, many of which are available for sale to individuals or collectors. For an alternative artistic style, call in at Ceramicarte, one of the best-known galleries and shops in the area around the Largo da Assunção square. Ceramicarte features many bold, modern pieces by ceramic artists and sculptors practicing both locally and further afield. Ceramic art is a major feature of the Portuguese artistic and cultural scene dating back for centuries and it is fascinating to see how this traditional, ecclesiastic style has evolved and developed with the passing of time. Finish your cultural tour of Cascais at the Marine Museum, or Museu do Mar. The Marine Museum is a must for anyone with any interest in marine history or indeed the age of discovery that defined much of our modern world. It was at Cascais that Vasco da Gama’s first Captain disembarked to inform the King of Portugal of the news of their successful voyage to India and the town has had a strong marine tradition ever since. The Marine Museum is full of interesting facts about the age of discovery along with model boats and other artifacts that document the way of life of the local fishermen who work off the Portuguese coast. Shells and fish abound both from the local waters and from throughout the North Atlantic and there is plenty to entertain both adults and children whether they are visiting on a cool off-season afternoon or looking for some relief from the hot summer sun. 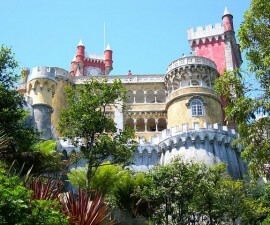 Simply wandering around the streets of Sintra and admiring its castles and palaces is like being in a museum in itself, but there are two destinations that should be on the cultural itinerary of any visitor to the town with an interest in art or history. The Museu de Arte Moderna, located in Sintra’s modern quarter close to the station, was Portugal’s first contemporary art museum and houses an impressive collection of paintings and sculptures from the twentieth century. The Museu de Arte Moderna has enjoyed such success that an annexe is now planned for Belem in Lisbon’s city centre. Finish your tour of the local museums and galleries with a relaxing walk around Sintra’s Toy Museum, located close to the historic district in the former building of the Sintra Fire Brigade. The Toy Museum makes for a light-hearted few hours of entertainment for visitors of all ages, fascinating the little ones and transporting the rest back to happy moments of their childhood. Exhibits include some exquisite dolls houses and a range of Barbies through the ages as well several great examples of the one-time pretender to her crown, Sindy. Boys will love the Second World War tin soldiers and hundreds of planes, trains and automobiles.